As the multimedia and connectivity expectations from future IVI (in-vehicle-infotainment) systems grow tremendously, a powerful, feature-rich middleware is required to automotive projects. 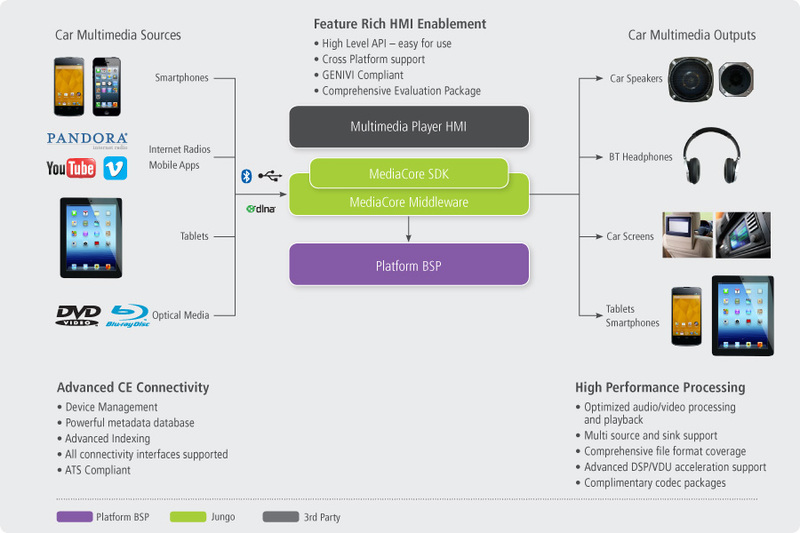 Jungo’s market-leading IVI multimedia middleware enables carmakers and their Tier-1 suppliers to develop unique UX designs, with a wide range of media features and highest possible levels of interaction with CE device o rCloud sources. With the Jungo software, carmakers have the control, the independence and the flexibility they need to offer the latest features in their products and accelerate innovation. With its exceptionally simple yet versatile API, Jungo’s IVI multimedia software decouples applications and services from the hardware on which they run, creating a common software base for all IVI products. This open plugin architecture enables the seamless deployment of new services and features, ensuring consistency with latest CE products and protocols as well as providing a path to support future ones. MediaCore, Jungo’s IVI multimedia software, is field proven and has been selected by leading device manufacturers as the basis for their feature-rich IVI products. Jungos CarPlay and Android Auto Software provide a complete set of smartphone connectivity software enabling cutting edge connectivity to latest Google and Apple phone streaming solution.